Guys no longer have to run around in pre-race skirts (but still can). Filled with Primaloft insulation, the Dynafit Radical shorts can be zipped on and off over a race suit or touring pants. Providing the perfect insulation in the perfect spots, the shorts are sometimes just plain perfect. Whether high on a ridge or feeling low after a race, throw on the shorts for some warmth and weather protection. They are also great driving shorts which you can leave on until your blood starts flowing up the hill. Easily the most Radical winter shorts. Water-repellent and wind-resistant nylon shell is great for sitting on snow or booting ridges. 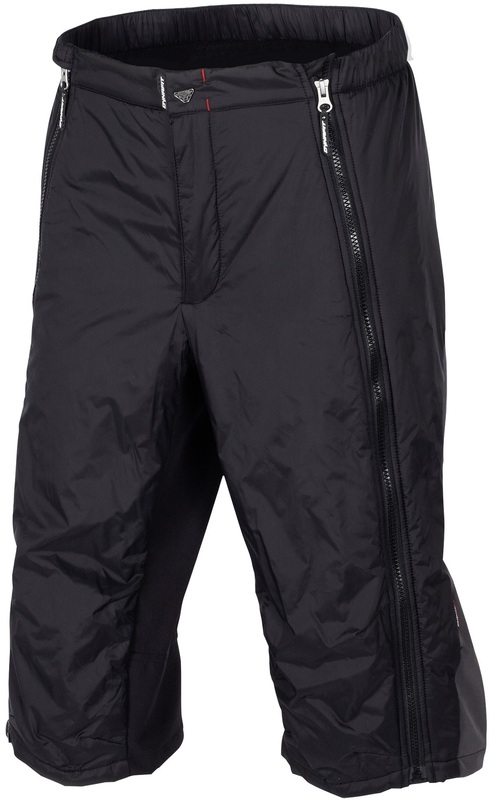 Full size-zips for putting the shorts on and taking them off without removing your skis. Stretchy Stormwall inserts all you to move in the shorts so you can skin with them on. 60g of Primaloft Silver Sport insulation keeps you at optimum breeding temperature. Snow gaiter, reflective stripe, adjustable waist, and stow pocket complete the list. About sizing: never tried Dynafit outerwear and do not know which size to choose. I wear 30" pants and need overshorts to go loosely over my ski pants (loose fitting arcteryx stinger bibs, size M) or lightweight climbing softshell pants (OR, Marmot, size S, form fitting). Can you compare the sizing of Dynafit to Arcteryx or Marmot or OR? Or is it possible to measure the waist width of the garment, S and M sizes, will appreciate it very much! Thank you in advance! Hi Kimi, thanks for pointing out we failed to upload the sizing chart! It's there now; for 30" you should be looking at the XS if your undergarments are slim, or S otherwise.